Rishikesh, being revered as the River Rafting Capital of the country offers a plethora of options for all age groups to enjoy a leisurely taste of adventure. 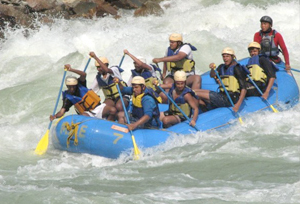 So, if you crave for a wild gush of adrenaline, then Rishikesh is the place to be. This ‘abode of Gods’ in the Himalayan region also offers picture-perfect beauty, thus making it ideal for a rafting tour. Brahmpuri happens to be the closest ‘take-off’ point from Rishikesh. Prior to your strapping of the harness, it is advised to seek expert consultation from tour guides and instructors. Irrespective of whichever age group you may fall into, always keep in mind that you have to pay heed to the slightest detail offered by the experts. The river rapids in this particular realm, fall into Grade I and II. Since this is the very basic class of rapids as per the international grading system, newcomers usually prefer Brahmpuri over any other starting point. The current along the rapids is relaxing, creating the perfect mood for an ethereal peregrination. One of the most popular rapids of Grade I to Grade II are the Sweet Sixteen, Double trouble and Hilton. 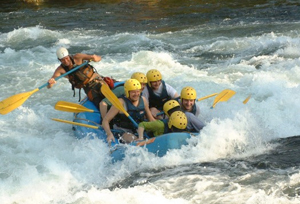 The rapids are Grade I, II and the whole session takes a minimum time of one hours to complete. The span is close to 9 kilometers. Day 01 : Welcome to the sacred city of Rishikesh around in the morning. Meet our representative who will assist you about our riverside beach camp location. On arrival at camp meet and greet by our camp manager. He will brief you about the do & don’ts, tent allotment & later have a mouthwatering breakfast at our dining area. After breakfast get ready for the adventure activity like rappelling/rock climbing nearby the camp.. Enjoy the lip-smacking hot buffet lunch and then spend some relaxing time by exploring the area or indulging in the exciting camp activities and games like cricket, badminton and volleyball. In the evening, enjoy a hot cup of tea with delicious snacks and bonfire. Dinner and relaxing overnight stay at the camp. Day 02 : Early morning, you can have a cup of coffee and a hearty breakfast. Leave the camp and start river rafting from Brahmpuri to Ram JhulaRishikesh for around 10 kms. Navigate through the wild rapids like the Initiation, Double Trouble, Hill Turn and Terminator. Besides river rafting, you also can also carry out body surfing and cliff jumping. Float past the beautiful temples, ashrams and Ghats nestled across the pious river Ganga. Arrive at your camp in Rishikesh.